Are you planning a trip to Jaen city and wondering where to stay? There's not a huge choice of hotels but you still need to choose and probably the Parador de Santa Catalina is the first to come to mind. Many times on TripAdvisors 'Top Ten Castle Hotels in Europe' list the Parador and its location needs to be visited even if you don't stay there. 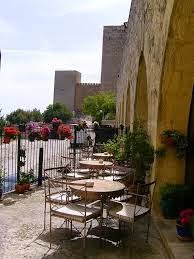 Wind up the side of the hill, through a flagged entry gate to the impressive 13th century Arabic Fortress extended in 1968 to become the state-run 4* Jaen Parador. With an enviable position and fabulous views from some of the bedroom terrraces it is without a doubt the place to stay. But it isn't really in the city centre and you'll need a car or taxi or to be very willing and fit to get down into the city and back. It's not far as the crow flies but almost 3 km of steep winding road. With 45 bedrooms and a roof top swimming pool this really is the best spot in the heat of the summer. 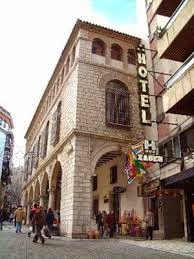 The 4* Hotel HO Ciudad de Jaen is just outside the city on the north side. It's big, clean, modern and has some nice views but a car or taxi is needed to reach the city centre from the maze of roads it is located on. A good base for work or an overnight stop rather than for tourists and longer stays. A huge plus is plenty of parking. 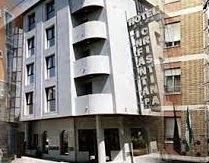 4* Hotel Infanta Cristina is on a busy road, quite a walk from the historical part of town. A touch of slightly faded old fashion elegance, move it into the old part of town and it would definitely be the best, sadly it's location amongst shops and workshops in the dingy modern part is a big letdown. But step inside for an instant uplift. Hotel Condestable Iranzo is another 4* hotel located between the bus station and train station on a busy crossroads, handy for the museum and shops, a bit of an uphill walk to the old quarter. In need of a freshen up the outside gives a fair opinion of the decor - bland. Underground parking is available, charged daily. In the centre the 3* Hotel Europa isn't immediately obvious and parking is down the road, not ideal if you have a lot of luggage. It is the closest to the bus station if you're walking and a good spot for exploring the city. The 3* Xauen Hotel has a lovely small roof terrace with cathedral and Parador views. It's modern and clean, with a great location. Parking again is a bit of a pain. Pull up and unload right outside the door and ask for directions and a discount ticket for parking just three minutes walk away. The rooms are nothing special but more than adequate. There is no lounge or restaurant but plenty two steps outside the rather nice lobby. Tip - Ask for a room on the upper floors to get a reasonable view rather than walls!